U.S. fighting M3 knife for paratroopers, heaviest quality with stamping "1943" on the blade. U.S. Army M6 Paratrooper Scabbard for the M3 knife, WWII reproduction with stamping and sling for leg. Reproduction M-3 fighting knife issued to US troops throughout WWII. These were approved for issue to any troops armed with M-1 Carbines as they were originally designed without a bayonet. Despite the stereotype, these were carried by any and all troops who could get their hands on one, not just Paratroopers armed with carbines. 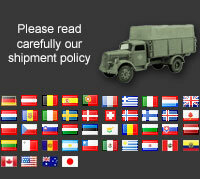 We will NOT ship knives or bayonets outside of European Comunity. No International Orders! Due to the fact that these items are classified as "weapons" by many countries, we are not willing to deal with the headaches of various customs regulations.